These words sum up my feelings about This Time Together , by Carol Burnett. Now, I have to confess that my exposure to Carol Burnett is limited. I've seen bits and pieces of comedy sketches she has done. My most vivid memory of her is as Miss Hannigan in the movie Annie. She is always spoken so highly of though, and seems to have made the whole world laugh at various points in time that I was very curious to read this book. This Time Together : Laughter and Reflection is a quick and easy read. The book is a collection of short stories based on Q&A sessions that she has hosted with studio and theater audiences around the country. For anyone familiar with the Carol Burnett Show, she would host Q&A's to warm her audience up and get them ready for the show. Essentially, this book reads as a series of short stories that she would give in answer to people's questions regarding her early career, interactions with other television and movie stars, etc. I so enjoyed hearing about her relationship Jim Nabors (aka Gomer Pyle), CARY GRANT (my personal favorite), Lucy (of the I Love fame) and many, many others. I laughed over her interchanges with fans and got a kick out of hearing some of her early New York experiences. Carol Burnett has a way of telling a good story and getting a laugh. I've come to realize this through reading this book and have since parked myself in front of Youtube watching various Carol Burnett Show clips. And it's FUNNY! But then, I don't really need to tell that to any long time fan of Carol Burnett! "This time I'm emphasizing episodes and anecdotes that have brought me to the present time, although I've also included a few stories from childhood that bear repeating. 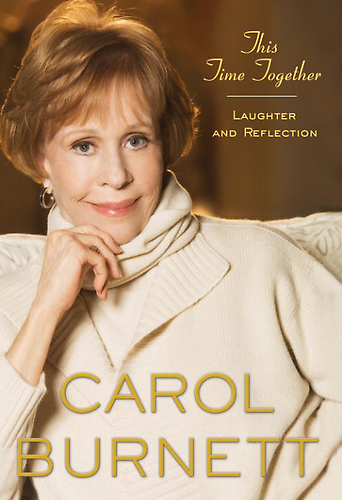 If you like Carol Burnett and her sense of humor, then I can't think as to why you wouldn't like this book. I'm glad to have read it as it made me more interesting in learning more about her. She's not just Miss Hannigan. She's that and so much more! I keep using this word - but thanks to The Crown Publishing Group for the FUN of this read - for keeping it clean and for making me laugh! I might have to put this on my TBR list. She talks a lot about the popularity of Harvey and Tim in this book. Which, thanks for reminding me, is going to set me off on another Youtube party! I also grew up watching Carol Burnett. Very funny lady. I watched the new(er) version of Annie and it just couldn't compare to Burnett's Miss Hannigan! Tim Conway always reminds me of the Apple Dumpling Gang. Hmmm... I might need to hunt that down for my kids. The older ones are just starting to understand that kind of slapstick humor. I also grew up watching the Carol Burnett Show and loved her and the whole gang! I think I would love this book. I have read her previous memoir, too. Thanks for the review! Oh, thanks! This will be a MUST-read for me. I remember faithfully watching reruns of the Carol Burnett Show every day after school. She was a hoot! I would have to say the Gone With the Wind spoof was my favorite, too! I've been subscribing to your blog for awhile and enjoying your reviews. First time to comment though. This was a great reminder of a great lady. I read her earlier book and was impressed with her willingness to get up and make life happen instead of waiting for good things to come. This is going on my must read list also. PS Your wedding photos are lovely.